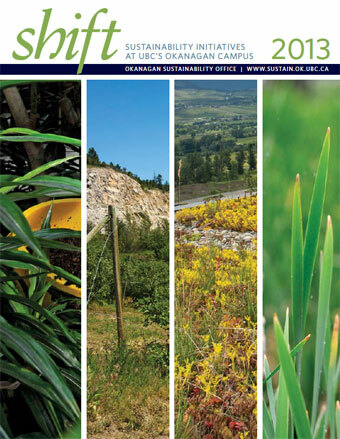 Welcome to the fourth edition of shift, UBC’s Okanagan campus annual sustainability publication. We are pleased to share examples of the work we have undertaken in the last year to advance sustainable development on campus and in the communities we serve. This year’s edition of shift features stories that highlight UBC’s commitment to sustainability – a commitment realized through the collective leadership of faculty and staff across the institution. Whether highlighting our performance in campus sustainability or our efforts to collaboratively enable project-based integration of research and operations, we continue to strive to influence key social, environmental, and economic sustainability imperatives. shift helps us to recognize and celebrate the work of others and instils a culture of leadership by example. We thank the contributors to this year’s shift for your tremendous leadership, and aspire to further strengthen our performance and resiliency as we progress together. Show and tell. And walk. UBC seeks opportunities for synergies between operations, research and teaching, and sustainability. A patchwork of drought-resistant plants around The Hangar Fitness and Wellness Centre marks a sustainability precedent. UBC draws together highly engaged partners to co-define and tackle sustainability challenges relevant to the region. What do we have in the valley, what do we love about the valley, and what are we afraid of losing? Sustainable Development: Campus achieves an absolute reduction in building greenhouse gas emissions! Sustainability Reporting: Reporting on emissions and actions taken to reduce emissions. Awards and Recognition: UBC’s Okanagan campus receives more than $200,000 in FortisBC rebates. Optimizing Space Use and Energy Conservation: The gym lighting replacement project provides brighter lights, reduces noise and power consumption. Campus as a Living Lab: Seeking opportunities for synergies between operations, research and teaching in a sustainable Okanagan context. Student Involvement – Annual Waste Audit: Students at UBC’s Okanagan campus are familiar with exams, but this one was very different. UBC’s Okanagan campus has developed sustainability initiatives and commitments that deeply align with advancing Place & Promise: The UBC Plan. The campus is committed to responsible stewardship of sustainability at all organizational levels, to reduce our environmental impact and embed a culture of sustainability. Thank you to the dedicated faculty, staff, students and community partners who contributed to this year’s shift magazine, the University of British Columbia Okanagan Campus’ annual sustainability publication. We are honoured to share and celebrate your success stories and thank you for your contributions to sustainable development on campus and in the community. We also wish to extend a special thank you to our utility provider FortisBC for your partnership in energy efficiency; to Gwen Steele, community partner for furthering sustainable campus development and the District of Peachland Mayor, Keith Fielding and the New Monaco development for your partnership in sustainable community development.